I get sick all the time. Mostly in October, when we have about 300 people that we hire on for our busy season at work. I take all of the precautions to stay healthy like taking vitamin C, obsessivly sanitizing my desk with wipes, and washing my hands many times over, to the point where they are dry. I even get my yearly flu shot. But somehow, I always get whatever is going around. I found this cold remedy on Pinterest, and it seemed tasty, so I thought, why not? I am on day 3 of this delicious concoction, and feeling much better. Coincidence or miracle cold remedy? Maybe there really is something to this, so thought I would share. Here is the original post. 1. 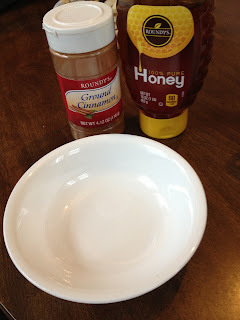 Mix honey and cinnamon together in a bowl. Take 1-2 times per day for 3 days for best results. Now that the holidays are over, and you probably don't need that Christmas wrapping paper for a while, you can put it away. One of the most annoying things I have found with that is that the paper can unroll and get wrinkled and ripped. This happens to me a lot because I transport it from place to place. This idea is so incredibly simple and smart to keep your wrapping paper from unrolling. Granted, tape would work too, but this method won't ruin any paper in the process. 1. Cut the toilet paper roll lengthwise from end to end. 2. Slip the toilet paper roll over the wrapping paper to hold it in place. Ta-da! Good to go for next year. Two of my favorite foods in the world are tacos and pizza, and when I saw this recipe that combined the two, I was over the moon for it! I made it for the first time and loved it. The nice thing is, you can jazz it up with whatever toppings you want to. As a note, you can substitute refried beans for the meat, or do 1lb ground beef and 1 can of refried beans. Simply heat the beans up in the microwave before adding to the crust. 2. Brown the ground beef in a pan. 3. Drain the grease from the pan. Add in the taco seasoning and stir in. Turn heat down to low. 4. Take the crescent rolls and lay them out in a cookie sheet. Pinch the dough together where there are gaps (essentially lining the entire pan with the dough. Push the dough up on the sides of the pan as best as you can without creating holes in it. 5. Put the cookie sheet in the oven and bake for 11-13 minutes. When the edges start to turn brown, remove from oven. 6. Sprinkle the taco meat on top of the dough. 7. Sprinkle the black olives on top of the meat. 8. Next, sprinkle cheese on top of the meat and olives. 9. Place back into the oven for 2-3 minutes--enough to make the cheese melt. Remove from oven and serve. 10. Serve with lettuce, sour cream, salsa, guacamole, chopped tomatoes, and any other toppings you would like. If you have seen my post on cherry cheese pie, this is basically that in dip form. It's a lot quicker to make, and a holiday hit at any party! Here is the original source. 1. Pour entire container of Cool Whip into a large bowl. 2. Add in no bake cheesecake mix, and beat by hand until well blended. A mixer is also handy in this case for blending. 3. Spoon a few spoonfuls of mixture onto a plate, and drizzle cherry topping over it. Add graham crackers on the side, and set out for guests. I have to say, I have been getting good use out of my glitter this holiday season, and I am pretty pumped about that. Several years ago, when my now teenage niece was just a little girl, we started this great family tradition of making reindeer food. I want to say the idea originated from a craft fair, but it was seriously like the best Christmas craft that ever happened to us, and it is super easy and fun. It's great for little kids. Once it is made, sprinkle it around your yard. It will sparkle especially brightly in the moonlight and the snow, and guide Santa's reindeer right to your house. 1. Pour about 3/4 cup of quick oats into a bowl. 2. Sprinkle glitter into the bowl. We added multiple colors, so the color and amount is completely up to you. 3. Mix it around with a spoon. 4. Pour the reindeer food into a container. This makes a great gift, and you can even jazz it up by pouring it into a jar, adding a ribbon, and making a label. I was browsing Walmart looking for crafty Christmas present ideas for my friends, and I found some really nice, inexpensive glass mugs. That gave me an idea to etch them each with the first letter of each friend's first name. When done, I also filled the mug with 2 packets of hot chocolate, mini candy canes, and marshmallows. I saw this cute winter idea on Pinterest and decided to give it a shot. Basically, I cut the sleeves off my too-small sweater and used them for socks in my boots. If you have any old sweaters, this is a great way to upcycle them. I think I can actually use the rest of the sweater for something else, so I will keep you posted on that. 1. Lay the sweater out on a flat and even surface. 2. Cut the length of sleeve you want for your socks. I have mostly ankle boots--even for my winter boots--so I didn't really need to make them long at all. 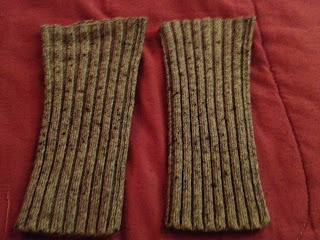 I cut where the ribbing stopped on the sleeve. 3. Slip on over your pants, and voilà! You can fold them down, stretch them out, or whatever you want to do. 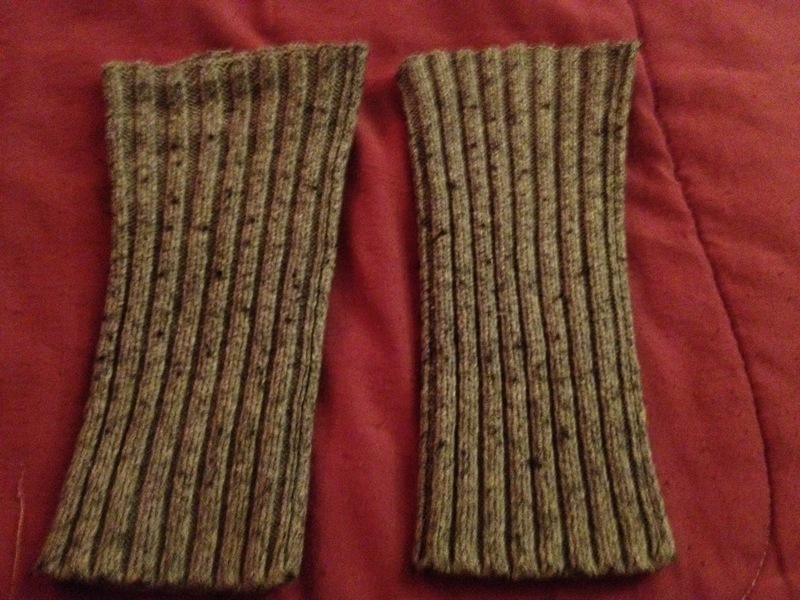 Makes a nice leg or arm warmer, too! 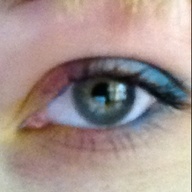 I originally did this look for spring, using yellow, pink, and blue eye shadow on top and bottom. It also makes a fabulous winter holiday combo with cool shades like green, blue, and purple. This is a great holiday pie recipe, and it's unique! My aunt introduced this recipe to us one year at Thanksgiving, and I have been in loveh it ever since. For those of you who are not too keen on cranberries, the bitterness of them is actually balanced well by the sweetness of the apples. I must warn you though, cooking apples that you slice up yourself are always best. If you use the apple pie filling in a can, your pie will be a little bit, shall we say, liquidatious. I know this from lots of experience! As a note, you will need 2 separate bowls: One for the pie filling, and 1 for the pie topping. 2. Unroll pie crust into a pie tin. Pinch the edge all the way around. 3. Wash, peel, and slice apples into small chunks (I would say for me that translates to half the size of a golf ball) and put in large bowl, along with washed cranberries. Set aside. 4. Mix all ingredients (minus the fruit) well in a large mixing bowl. Butter may not mix as well if it is not softened, so break it up with a fork into small pieces. 5.Once mixed well, add in the apples and the cranberries slowly, and gently mix until all fruit is completely covered. 6. Put all ingredients into the pie crust and set aside. Now prepare pie topping. 7. Mix pie topping ingredients together in a mixing bowl. Again, butter may not mix well, so break up with fork into small pieces. 8. Once mixed well, sprinkle topping over entire pie until covered well. 9. Bake for 40 minutes. I burned the edges a little as you can see, but I learned that if you put foil around the edge, it's much less likely to burn.